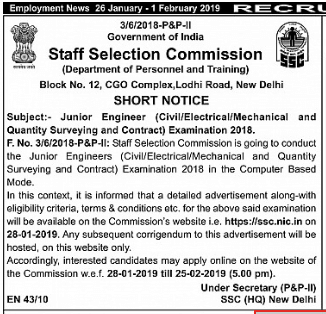 SSC JE 2019 Recruitment: Staff Selection Commission Recruitment Board has announced SSC JE 2019 recruitment notification to engage the candidates for Junior Engineer posts. As per the official report, the SSC JE 2019 Recruitment’s Apply link has activated on the respective regional office official site on 01st February 2019. So candidates can visit the official site to apply online for SSC JE 2019 Recruitment. SSC JE recruitment 2019 is used to recruit the Junior engineer vacancies for various disciplines. The applicant who is eligible with prescribed eligibility norms can start to file an online application for SSC JE 2019 here. One of the most awaited SSC recruitment among many aspirants is SSC JE 2019 Notification. Based on the expectation, the SSC recruitment board has out the notification for Junior Engineer posts for various departments. The starting date for the application will get activated from 01-02-2019. The final date for the submission of the SSC Online application will get ends by 25th February. So Interested candidates kindly read the official notification available in the official site and start your application process. Applicants should submit your application on or before the last date. Details regarding SSC JE recruitment 2019 is given below for your kind reference. To start applying for the SSC Online application, everyone should know your eligibility criteria regarding the given notification. Everyone should fulfil the criteria prescribed by the recruitment board. Here we have given you the details of eligibility criteria. So interested aspirants kindly utilize this. 8 Junior Engineer (QS&C) – MES Applicants should have a B.E. / B.Tech. / 3 years Diploma in Civil engineering from a recognized University/Institute. Passed Intermediate examination in Building and Quantity Surveying (Sub Divisional-II) from the Institute of Surveyors (India). The written examination will be conducted by Paper-I and Paper-II. Paper-I contains 3 sections namely General Intelligence & Reasoning, General Awareness and General Engineering (Civil/Mechanical/Electrical). All the sections are in multiple-choice questions in the online-based examination. This paper will be conducted for 200 marks with a 2 hours time duration. There will be a 0.25 negative marks for every wrong answer. Paper-II is a conventional type examination. Paper-II will be having 300 marks for General Engineering in Civil & Structural/Electrical/Mechanical. This is a pen and paper based mode of examination. The recruitment board will evaluate the paper-II only those who qualify the paper-I examination. The interview is the final round of selection of qualifying candidates. The interview will be conducted for 100 marks. Candidates those who qualify the paper-II will be allowed for the interview round. Then finally the merit list will be prepared based on the following procedure. (i) Total marks in written examination. (iv) Date of birth, with older candidates, placed higher. (v) Alphabetical order in the first names of the candidates appear. How to apply for SSC JE 2019 Recruitment? Candidates kindly visit the official site sss.nic.in. In the home page itself, there will be a link regarding SSC JE Recruitment 2019. Kindly read the notification to know your eligibility criteria.